“Education, education, education” has long been a mantra of Reef Conservation Mauritius so how are they getting the message across to the current generation of students? To find out, we paid a visit to “Nauticaz”, a facility provided by Attitude Resorts at Marina Hotel, Anse la Raie and operated by Reef. 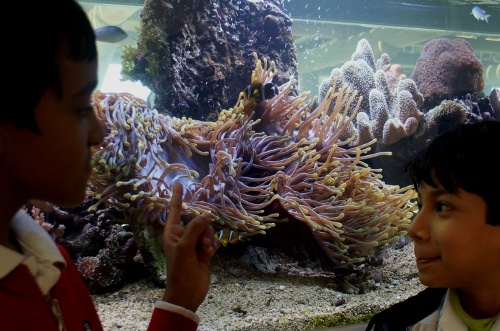 It comprises a small class room which doubles as a laboratory, a library and a beautiful marine aquarium. We were introduced to one of the instructors who exemplifies the old adage that “the best way to learn is to teach”. Olivier Eyries is a French university student on a short internship in Mauritius organised by AISEC who wanted to find out more about the environment. His task was to take students from Hampstead Junior School, Pamplemousses on an informative tour of the surroundings. The first stop was a nearby inshore wetland where Olivier explained the importance of these natural features. The main role of these micro-ecosystems is to act as a buffer that collects rainwater and to clean it before it percolates through rock and sand into the sea. Olivier explained how backfilling wetlands for construction leads to flooding during heavy rains and contributes to storm water run-off that carries pollution directly into the lagoon. 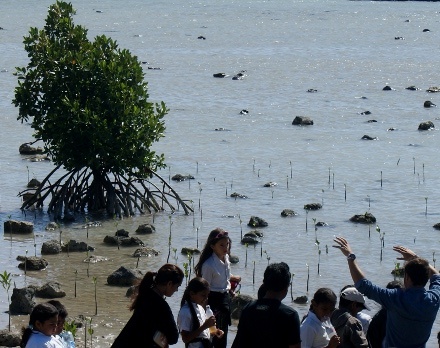 Next the students were taken to the coast to learn about mangroves, although they were somewhat distracted by crabs scurrying into their holes en route. Mangroves are distinctive trees that have adapted to growing, partly submerged, in mud and silty sand on the edge of the sea. Their distinctive roots, partly exposed to the air, form an intricate network that provides vital protection against coastal erosion caused by waves and trap sediment, preventing it from clouding the waters of the lagoon. They also create a protective nursery for fish and crustaceans. Mangroves have an unusual form of reproduction. Like mammals, they produce live young rather than seeds. Cigar shaped “propagules” hang from the plant, drop into the water. Some spear themselves in the mud, while others float around until they come to rest. At suitable locations they put down roots, lift themselves into a vertical position and start to shoot. The students took delight in “helping” nature by planting fallen propagules in a mangrove garden that is slowly taking shape. 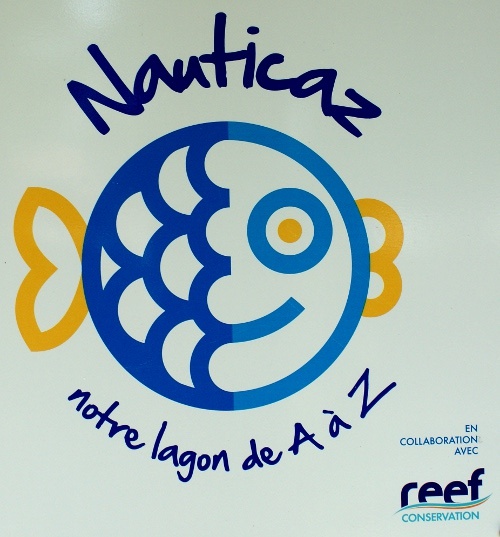 Back at the Nauticaz, Reef staff took over, explaining other aspects of the marine environment to the children. This extended from huge whales and sharks, many of which are endangered, to the tiny creatures, called polyps, that are responsible for constructing our coral reefs. Much emphasis was laid on protecting corals from human impacts such as people walking over them, anchor damage and pollution. A visit to the beach resource centre at Péreybère, where the students learned about rocky shore ecosystems and helped clean the beach, completed the day. Quite a commendable endeavour and may Nauticaz succeed in educating more people all the time!